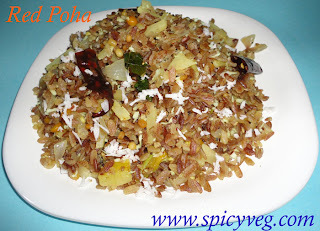 Thick red poha is the healthier version of the regular white poha and is now available in most of the grocery stores . 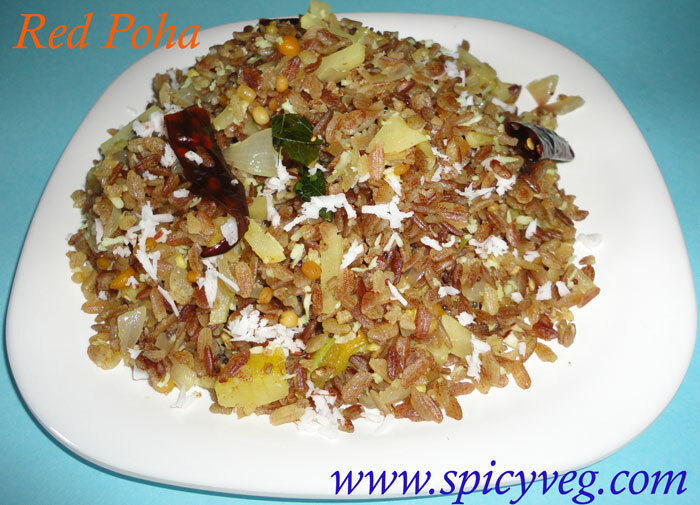 This convienient food is similar to the white poha in taste and in spirit. 1.Wash the poha well in several changes of water, till the water becomes clear. Drain well and keep aside. 2.Heat the oil in a kadhai add urad dal , channadal ,and mustard seeds.Add red chillies. 3.Slide in the curry leaves and chopped green chillies. After a minute or two, when the curry leaves and green chillies begin to brown, add the chopped onions. 4.Cook the onions till they turn translucent and then add the potatoes. Cook for 5 minutes, turning occasionally. 5.Sprinkle salt and turmeric powder, mix and add the poha. 6.Turn around gently so that the poha does not become mushy. Cook covered for another 6-8 minutes, stirring carefully every other minute. 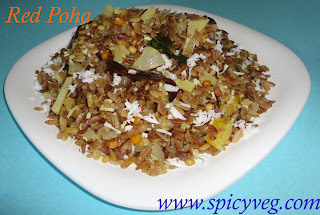 7.Add grated coconut to the poha and mix well. 8.Sprinkle a tablespoon of lime juice , mix and serve immediately.